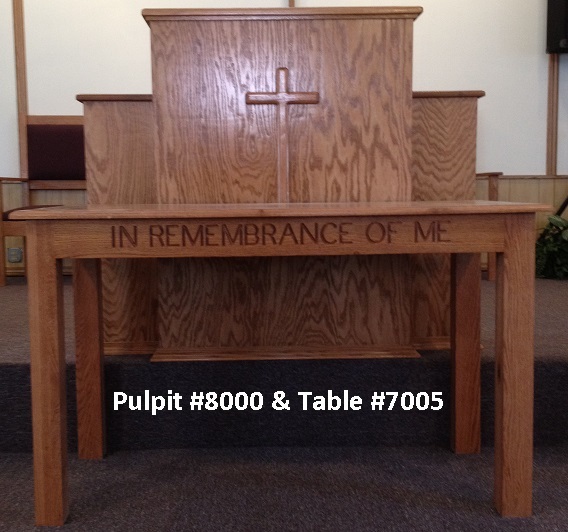 If you look at our catalog, you’ll notice that there are different numbered styles as well as names for different features, like stain colors or pulpit styles. The best way to figure out what church furniture you’d like for your church is to look at the different types of church furniture we offer and think about what fits your church best. We’ve made thousands of pieces of church furniture and while many of them were style featured in our catalog, we have also built special designs for churches. The first step is figuring out exactly what style you’d like in your church for your furniture. For instance, you might like #2001, shown at left. This style of church pew has a strong geometric look with sharper corners than some of our more rounded styles. These also have woodworking on the side showing three crosses. But not all churches want floating pew ends. Some prefer the look of pew ends that meet the floor. A similar style, #2003, shown below, is similar to #2001 but with a pew end that’s solid to the floor, instead of the cantilevered style. 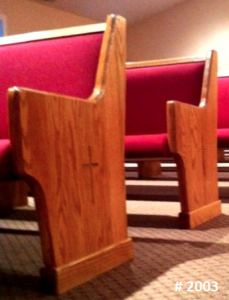 These two church pew ends are very similar but there are slight differences that change how they look in a church sanctuary. 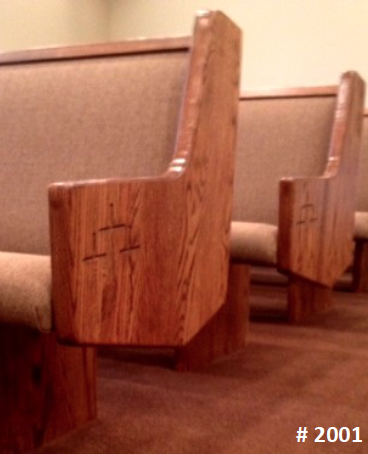 You’ll also notice that the woodworking is larger on the #2003 style pew ends and in the center, instead of offset. When you’re using our catalog, if you don’t find exactly what you like and want a combination of two styles or something entirely different, give us a call and we will likely be able to build what you want. We love working with churches to create special orders and it’s easy with us—that’s the benefit of working with a small family-owned, American church pew company.